Many people are familiar with my dedication to the Morrigan but what may not be as widely known is my love of Brighid. It is, by its nature, a different sort of love, but it is just as much a presence in my life in its own way. 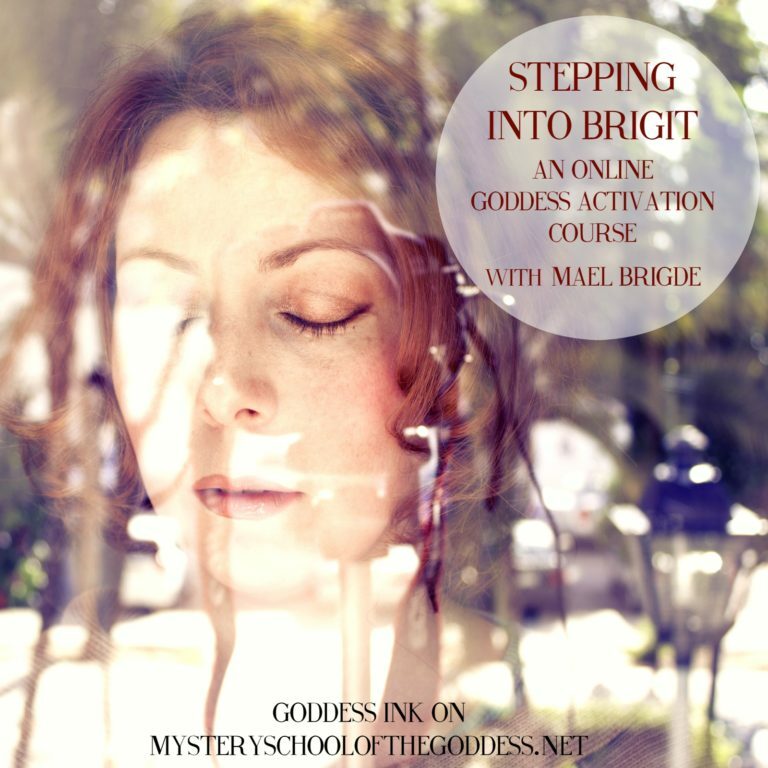 So when I was asked to help Beta test* a new course 'Stepping Into Brigit' designed for people interested in Brighid to learn about and connect to her I jumped at the chance. The course is set up as an 11 module course, with each module containing multiple lessons, and is meant to be done - ideally - over a month. With roughly 38 overall lessons to complete (course surveys excluded) one would need to either decide to do one or more lessons a day or set aside time every few days to do a full module in order to finish in a month. What I liked about the set up though is the learning is self paced, so that you can choose to it at whatever speed you like and in whatever fashion works best for you. I took the 'chunky' approach myself and did a full module at a go because that was what worked best with my schedule, although other people may find a slower spacing better. Each lesson is fairly thorough but also brief. At some points I felt perhaps a bit too brief, but the idea was to take time with each one and contemplate it, write down thoughts and reflections on the material, and really process it, rather than rushing through to get to the next one. They often included outside recommended reading or references to follow up, such as the Story Archaeology's entry on discussing her which should take some time to do. With that in mind the size of each lesson is pretty good, and it really was designed to encourage engagement from the student. I also like the use of mixed media throughout the course which used text, images, videos, and audio clips. The material looks at Brighid in a holistic manner including both the pagan Goddess as well as the Christian saint, and while I didn't feel the same engagement with the material relating to the saint that reflects more of my own bias than any flaw in the course. It certainly was the most well-rounded view I think I've seen and I can't fault it's fairness in giving an equal voice to all sides. the material is generally presented without any favoring of one opinion over another and with clear citation of sources, allowing a student to draw their own conclusions for the most part about the very complex subject of Brighid pagan roots and Christian history. Speaking of sources, I really did like the way the course offered a lot of quotes directly from source material. I think often this is the best way to let a student contemplate the original material without the filter of an author's opinion. I also like the amount of poetry included and the way that allowed me, as a student, to experience the material without overthinking it and to appreciate the beauty of the ideas presented. I also liked the option of entering feedback after each lesson, to share personal experiences or thoughts. I did feel there was a lack of more directed exercises beyond the journaling being encouraged, but I acknowledge that not all students want to feel like they have written homework to complete. The overall feel of the course was contemplative and engaging without being tedious or excessively 'school-like' in its feel, which I think will have a wide appeal to modern adult spiritual seekers. There are many people out there interested in Brighid and many seeking classes or courses online to help them better connect to spiritual things of interest. For those looking to learn about and connect to Brighid I think this course would be a good option, if you find that online courses are generally a good option for you. As with any such course it requires a person to be self-motivated to do the lessons, and to incorporate the material in a practical manner. However for someone who has the desire to truly make use of what this course is offering I think a great deal of valuable knowledge can be gained here. *to be clear - I was asked to Beta test the course by its creator, but this review is being offered by me freely and without any compensation. As far as I am aware I was asked to help test the course in part because of the book I had written on Brighid and my knowledge of Her, and in the interest of transparency my book Pagan Portals Brigid is recommended reading for this course. However I would not and will not endorse nor recommend anything I do not genuinely see value in and my opinions offered here are honest; had I not seen value in the course on its own merits I would simply not have reviewed it. Thank you so much for this, the synchronicity is amazing.